Yesterday I marched with more than 400,000 people to demonstrate to world leaders that it is time for a multilateral treaty to reduce carbon emissions as they prepare to gather at the UN’s Climate Summit. Mitigating and adapting to climate change have to become priorities for the entire world, and collaboration and cooperation are the only ways forward. We successfully reduced the damage being done to our ozone layer due to the manufacture of chlorofluorocarbons (CFCs) because of an agreement known as the Montreal Protocol, so there is precedent for a worldwide effort to prevent global catastrophe. We are capable of doing so much more than we have been doing, and to be a part of this demonstration was heartening and inspiring. One of the things I noticed was how squeaky clean the streets were. Central Park West, down West 59th Street to Avenue of the Americas, down to 42nd Street, there was no litter to be seen. These people care! I only point this out because as a New York City resident, even a four hour street festival, through which maybe 1,000 people pass, generates enormous piles of trash, not only in the waste receptacles but in the gutters and on the street and sidewalks! I am consistently appalled at these sights, so to have 400 times as many people, for a day-long event, and to have a 100 times cleaner result is truly remarkable. Congratulations to everyone who participated! The article below speaks to the magnitude and significance of our accomplishment. Let’s continue to march forward in our quest for a global commitment to reduce the harmful effects of climate change. NEW YORK — More than 400,000 people turned out for the People’s Climate March in New York City on Sunday, just days before many of the world’s leaders are expected to debate environmental action at the United Nations climate summit. Early reports from event organizers are hailing the turnout as the largest climate march in history, far bigger than the Forward on Climate rally held in Washington, D.C., last year. High-profile environmentalists including Bill McKibben, Leonardo DiCaprio, Jane Goodall and Vandana Shiva marched alongside policymakers such as Sens. Sheldon Whitehouse (D-R.I.), Bernie Sanders (I-Vt.) and Charles Schumer (D-N.Y.). U.N. Secretary-General Ban Ki-moon and former Vice President Al Gore were also there, and more than 550 buses carried in people from around the country. The rally comes at an opportune time as 120 world leaders, including President Barack Obama, are expected to convene Tuesday at the United Nations in New York to discuss ways to tackle the growing threat of carbon pollution. The White House has pledged to “show the world that the U.S. is leading on climate change, and to call on other leaders to step up to the plate,” John Podesta, who serves as a counselor to the president, told reporters on Thursday. However, a recent study found that the world spewed more carbon dioxide into the atmosphere last year than ever before, primarily driven by China, India and the United States. And the top leaders of China and India announced earlier this month that they won’t be attending Tuesday’s summit. The march began around 11:30 a.m., at New York City’s Columbus Circle just off Central Park. At times, it stretched more than 4 miles as marchers carried banners, signs and entire contraptions depicting everything from Mother Earth herself to the dinosaurs that now make up fossil fuels. 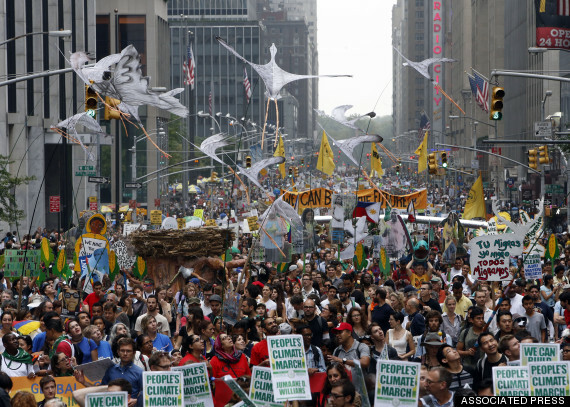 Demonstrators make their way down Sixth Avenue in New York during the People’s Climate March on Sunday. Hundreds Of Thousands Turn Out For People’s Climate March In New York City. This entry was tagged #anthropocene, #climate, #climatemarch, #climatesummit, #earth, #hope, #inspiring, #newyork, #nyc, #planet, #sustainability. Bookmark the permalink.